Hi, I’m Troy, your Personal Trainer in Vancouver and the owner of T-Squared, Vancouver personal training. I became a health and fitness trainer to help people stay on track of their health and fitness goals. I love seeing my clients achieve the results they deserve after following my exercise, workout and health plans. Exercise: We know we need it, but it’s so hard getting started. I got started in my early 20’s. My best friend was a world record holding powerlifter and he took the time to teach me the proper techniques to work out safely and effectively. From there, I took what he taught me and shared that with my friends. We all trained together at the gym regardless of our levels and goals. One of the friends, was a lady in her 40’s who I ran with in our local running group she dropped 40 lbs and gained a nicely toned body. That gave me the motivation to leave the Electrical and Electroncs industry to become an expert personal trainer in downtown vancouver. Are You Ready for a Fun Workout? I teach my clients the right way to exercise and I hold them accountable to keep their workouts on track. Proper form and technique is the focus, to ensure a safe workout. I utilize different techniques and equipment including the Total Gym Gravity Training system. This keeps your workouts effective, energizing and I keep it fun! That way, you don’t even realize the time is up until you start stretching. I first started my fitness certification at Douglas College in 2005 and upgraded with InfoFit fitness educators in 2008. 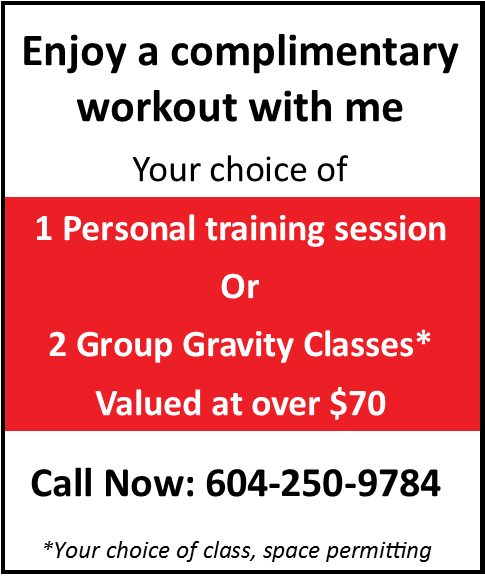 This increased my Fitness knowledge base immensely and shortly after I became a certified personal trainer using the Gravity Training System. On top of that, I also increased my post rehab knowledge. As a result, I can help people with injuries recover, and help those with special needs reach their fitness goals. Improving my knowledge is very important to me so I can provide my clients with the most effective training techniques. That’s why I continue to take new courses as often as they come out. Being a personal trainer in Vancouver is more than making people workout; it’s about educating them on the most effective ways to exercise. I help my clients make fitness a part of their daily lifestyle. This way, they’ll enjoy the positive effects of fitness for the long term. Call me for a complimentary workout. You’ll gain a better understanding of how I can help you. And you’ll see what makes Personal and Small Group Personal Training at T-Squared the most fun you’ve ever had getting fit. Photos of my happy client, pro mountain bike racer, Cole Carter.